Zendesk Chat provides your business with an advanced solution capable of providing a proactive, real-time, and customizable experience for your customers. Not only is Chat easy to set-up within your Zendesk, it also provides advanced ticket functionality, analytics, and overall workflow. Live Chat is a faster and more personal way to engage with customers. 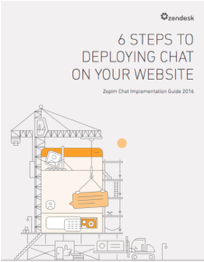 But to make the most of live chat, you'll need to learn how to properly deploy and manage it. 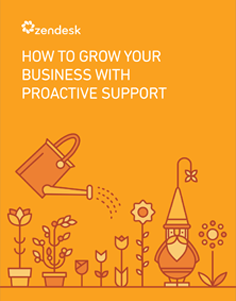 The guide brings together the Zendesk Chat team's collective live chat knowledge and experience into one comprehensive resource, offering high-level guidance, as well as best practice tips for support managers and administrators implementing live chat on their site. Edmunds.com, a customer of Zopim, was featured in this Gartner report. Read on to find out more about Edmunds.com’s 24x7 multi-channel support. There are so many ways people can chat or message each other every day: through Facebook Messenger, Google Hangouts, or apps like WhatsApp, SnapChat or WeChat. That's why it comes as no surprise that live chat, as a digital customer service channel, is increasing in both popularity and usage. According to an October 2015 report from Gartner: "Live chat is increasing in popularity as a preferred customer digital engagement channel, today representing 2% of overall interactions, and growing to 10% in 2018. By 2018, over 80% of companies will offer some form of live chat on their website or on mobile devices to interact with their customers." However, implementing chat as a long-term strategy can be challenging. Craft the customer service journey and find the moments of truth in the digital touchpoints to proactively offer personalized live chat on your website and within your mobile apps. Position live chat as part of an overall long-term customer engagement strategy. Set up a comprehensive knowledge base to provide consistent responses and support multiple simultaneous chats. Articulate how you want to organize the handling of live-chat sessions in your customer engagement center. Understand the importance of the UI design for both customer and agent window alike. Start small—limit the number of scenarios where live chat becomes active, and continuously measure the performance of chat agents and their impact on customer experience. The full report is no longer available for complimentary download. Read more about this and other Gartner research on the Gartner website. You might also like this Gartner report about CRM customer engagement centers, which is available for complimentary download via Zendesk. Gartner Best Practices for Making Live Chat a Must-Have Engagement Channel, Brian Manusama, 29 October 2015. In recent years, companies have realized that providing customers with greater engagement opportunities can increase overall satisfaction and make their brands more appealing. Indeed, according to a report from the Aberdeen Group, 94% of organizations provide service and support across multiple channels (including, email, telephone, e-services, Web queries, remote support, social media, live chat, mobile messaging, and forums). The increase in engagement channels has also made customers more demanding. They want greater flexibility, require real-time interactivity—as opposed to the more static “send request and wait” experience—and seek ways to get service as quickly as possible. In fact, brands have begun to realize that the most effective tactic is to be where the customers are, rather than always trying to bring traffic back to the brand. It's no longer enough to merely provide support—a company also needs to be approachable and available on a variety of channels. Today, live chat is becoming increasingly important and profitable as a customer engagement platform. In fact, in a survey conducted by Forrester, 44% of respondents said that having a live person answer their questions while they were in the middle of an online purchase was one of the most important features a website could offer.